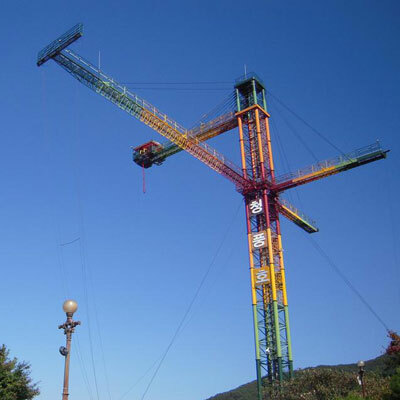 The Extreme Machine is designed to provide the biggest bang for your buck by combining three, four or five of the most extreme activities available into a single vertical tower. The single tower replaces the several vertical sections that would be required if the rides were built individually. • Bungee Jumping - still the most adrenaline producing activity on the planet. • The RIPRIDE® zipline - Fly like Superman on the fastest ‘flying fox’ around. • Big Swing - A 50m arc in our purpose-built chair. • The Ejection Seat® - Shoot straight up at 90 degrees on our specially designed chair. • Skyscraper - 4 or 8 riders are seated on the ends of two windmill-like arms, rotating at up to 60 mph and pulling 4 Gs. • Catapult – One rider propelled at 45 degrees from a giant slingshot! • Observation Deck - Watch all the extreme activities from a variety of unique perspectives at a height of 50m. With up to four activities plus an Observation Deck, The Extreme Machine design allows for the most efficient use of space possible. You also save by installing one tower to operate four activities. Minimize your capital investment and maximize your revenue per square meter. There’s no doubt about it, if you are investing in the elite extreme rides, The Extreme Machine gives you the most for the least! Every Extreme Machine comes with 24-hour technical support that continues throughout the life of the ride. We’ll give you help with the implementation, installation, and start-up operations. Low-cost liability insurance is available and Gravity Works/BCI provides one of the strongest warranties in the industry.